I am literally in vanilla heaven, The Body Shops Madagascan Vanilla Fragrance Mist smells incredible!! There are not enough words or adjectives to describe how great it is! :) Fantastic, amazing, wonderful, heavenly, sweet, lovely, divine, and excellent, are a few that spring to mind! 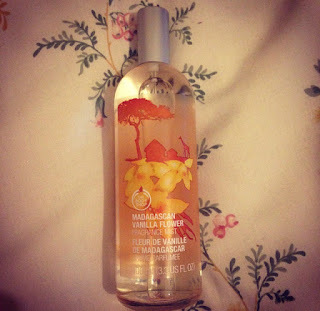 The Madagascan Vanilla Fragrance Mist is lovely and my new favourite scent from The Body Shop! I could smell it for hours and not get sick of it!! I am loving their products at the moment and have bought quite a lot from them recently. They have had so many great deals on, currently you can get 40% off most products in store, however, it ends of Tuesday 4 November so get down there quick. The fragrance mist has a sweet scent but not sickly, it is light and refreshing. It is like having a hint of Summer in Autumn with all this awful rain. It lasts for a while and the smell doesn't fade from my clothes, I am very happy with my purchase and will definitely get it again!! The Body Shops body mists are very good in quality and price! £7.50 for 100ml may seem a little bit expensive but they last for a long time, I have used different ones in the past and have been satisfied with how long I have had them.